Late 1920's B&D Montana Silver Bell #1 Tenor Banjo. A model with the full-scale elevated fingerboard, this neck has 19 frets to the body with another 5 frets over the head. The heel-carving is professional-grade, but may be after-market. Same is true with the gold-plating. The Knee-mute apparatus is included, but not presently attached to the dowel-stick... It looks to be in stellar condition. Sad to say, the knee-lever "Spoon" is missing... possibly ran away with the dish. Neck is straight, low action, recent re-fret. Gold-plated old Planets with Mother-of-Pearl knobs. Nice, original hard shell case. 10 1/2" rim with 24" scale. delivers snappy, yet non-metallic response. Un-played, but with a few dings. An all-original 1928 Epi Recording A tenor banjo with X-flange. Good neck and action, modest fret-wear. Grover 2-band geared pegs. Original case with delamination issues has been replaced with a period Slingerland hard case in excellent condition. Tuned to cello-tuning, an octave below tenor banjo, CGDA. Gibson seems to have made very few of these 14" banjos. Calf-skin head. Absolutely original down to last nut. Condition slightly used. Straight neck, low action. Got to be THE nicest example. Original Hard case in stunning condition. Gibson guitar-banjo. Brass-hoop tone-ring; Original tuners have been replaced with Grover Roto-Matics. Straight neck, modest playing wear, good action. 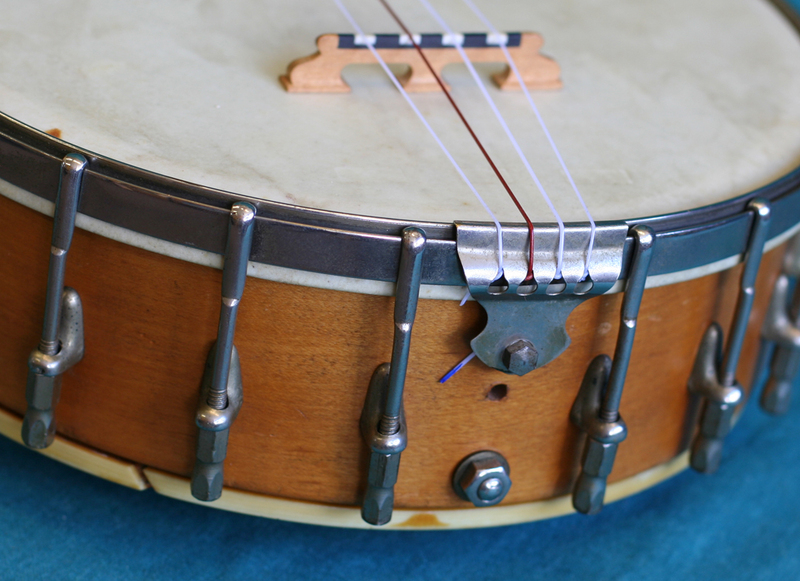 An early Gibson Banjo-Mandolin with 10 1/2" hollow rim and spun-brass tone-ring. Shot-Gun holes in tone-ring skirt. 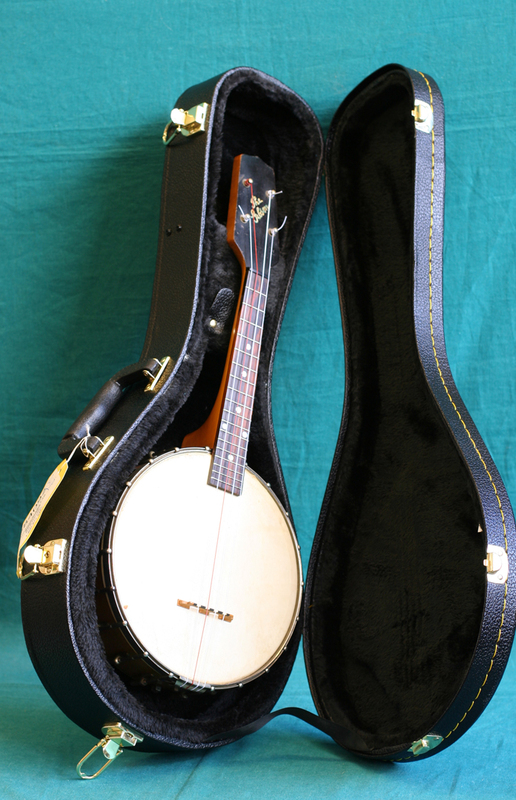 Gibson Flat-Head Mastertone Tenor Banjo. Nice Example, Very minor playing wear. rim and JLS Flat-Head Tone-Ring. Engraved MOP inlays on fingerboard, Like-New Gold-Plating. Great Set-Up, New TKL hard case. First Year Gibson Ball-Bearing Arch-Top Tone-Ring. Original 2-tab Grover pegs replaced with modern planetary geared pegs. Minor repair on resonator side. Minor seam separation on resonator side. In the list of "Other Brands made by Gibson"
Wolf Banjos are not mentioned. 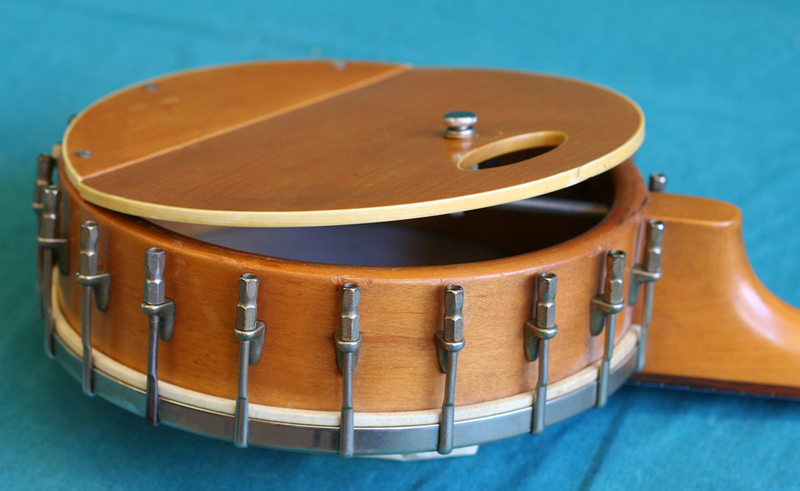 This is a standard TB-1 Open-Back tenor banjo. 11" 3-ply maple rim, 21" scale length and 18 frets. 1/4" brass-hoop tone-ring. a crude capo. Good neck and action.